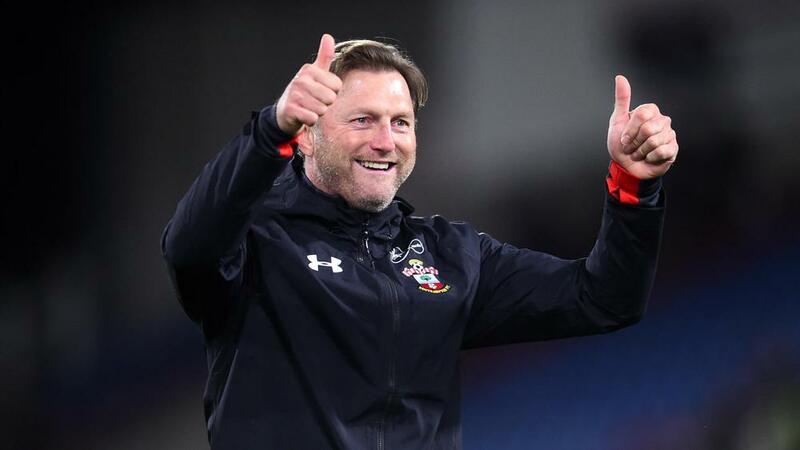 Ralph Hasenhuttl apologised to opposite number Chris Hughton for not shaking his hand in the immediate aftermath of Southampton's 1-0 win at Brighton and Hove Albion. Saturday's victory at the Amex Stadium lifted Saints five points clear of the Premier League drop zone on a day in which Huddersfield Town became the first team to be relegated to the Championship. Pierre-Emile Hojbjerg's goal early in the second period proved the difference as the visitors moved level on points with their opponents in the table. Hasenhuttl celebrated fiercely at the final whistle and acknowledged afterwards that Hughton may have been offended. "I understand he was maybe a little bit angry with me," Hasenhuttl said. "I always forget everything when the final whistle goes, so I'm sorry. I was five seconds too late but then I came and shook their hands. "For us in our situation it's very important to take this win against a tight opponent [in the table]. The three points are very important." Hughton, meanwhile, appeared happy to accept Hasenhuttl's explanation of the post-match incident. "If that's the case [an apology], I appreciate it but it's an emotional game and the emotions are as high when you win as they are low when you lose," he said. "I don't think anybody ever knows the reason why you haven't got to the levels you have after a break. "We did everything right, we trained hard but in the first half we didn't play anywhere near the level we needed to be able to go and win the game but we possibly [did enough] not to lose it."